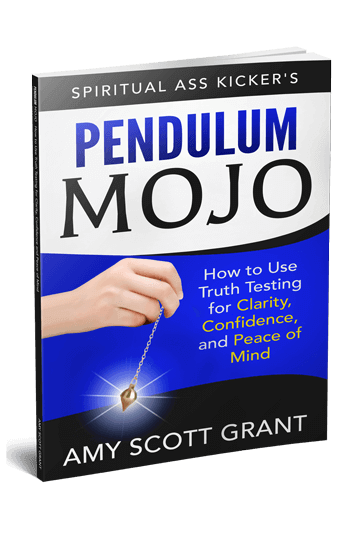 In this straightforward and highly entertaining comprehensive how-to guide, Amy Scott Grant will teach you how to harness the best “Truth Testing” methods with a pendulum, to create more clarity, confidence, and peace of mind. For centuries, seekers and healers have used pendulums to discern what is true, and to access and verify information from guides, Source, and the Highest Self. 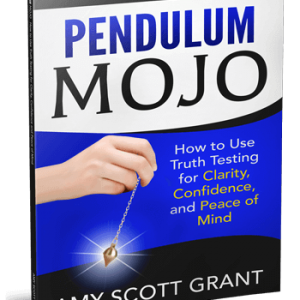 Now, in this straightforward and highly entertaining comprehensive how-to guide, Amy Scott Grant will teach you how to harness the best “Truth Testing” methods to create more clarity, confidence, and peace of mind. – Make the best possible decision in any given moment. – Be certain whether someone is telling you the truth. – Learn to trust and rely on inner guidance for support. – Find out what substances are good (and not so good) for your body. – Transform your relationship with your money. – Enjoy peace of mind knowing you’re doing the right thing at the right time, every time. Paperback version is 122 pages. Kindle version is available through Amazon.com. Found Amy on YouTube and decided to try her book. Don’t regret it at all. I learned a lot about pendulums and have found it to be accurate. I use the finger test for all of my supplements, essential oils, medicines, skin care products, etc. to see their effect on my body. So far, I’ve had great results, though I did have to give up a perfume that was testing toxic to me. Rather do that then poison myself though. Thanks Amy! Information you can actually put into practice. I’ve tried to read other books about dowsing and using pendulums, and frankly none of them felt like the right ones for me. 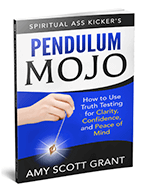 From the very start of Pendulum Mojo, the information and techniques just felt like what I had been seeking. Amy explains everything in such a straightforward way you can get started right then and there. Loved her writing style. I have road tested all her recommendations and they are right on the mark. There are a few things in the book that are not revealed in her You Tube videos. Perfect for use beginning to understand the power. Easy explanations and indicators for a true friendship between you and your stone. Give it a try, bought one for my granddaughter to enjoy the passion and excitement I love. Best dowsing book ever! Great for beginners and long time users. It helps you form better questions, for more accurate answers. It also exposes myths about your pendulum and its care. Short book, easy to read, and a the author has a cute since of humor! This is a great book for a beginner or someone interested in learning more about the dos and dont’s of pendulum usage. It is a great book, funny and very entertaining. I am glad that I bought it. I will buy other titles from her.